Such extreme joy on the faces of this bride and groom, who just seconds before were pronounced husband and wife after a long and emotional wedding ceremony in the sunken garden of Thornewood Castle in Lakewood, Washington. This photo was selected by the Professional Photographers of America (PPA) for their prestigious Loan Collection and was printed in the 2014 issue of their annual book of the best photography of the year. It was the only wedding photo by a Washington State photographer, and was one of the only photojournalistic (candid) wedding images, to receive that honor. 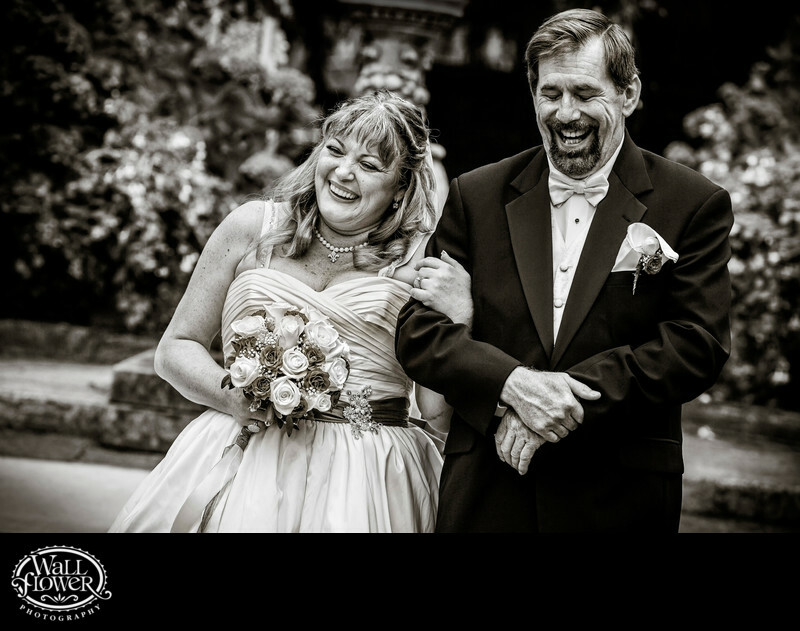 Although the color was beautiful, with the bride's bouquet and masses of flowering hydrangea bushes behind them, converting the photo to black and white (with a slight warm tone) takes away the distraction of all that beautiful color and helps you focus on the bride and groom's faces.